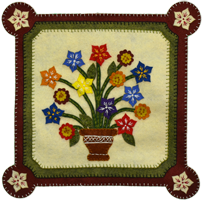 The Country Floral Sampler is an advanced kit. It is a great table centerpiece or an elegant wall hanging. The five-pointed star flowers are reminiscent of flowers like plumeria which come in lots of vivid colors. The rounded flowers are Roses of Sharon. All of the flowers are set in a nicely decorated pot. 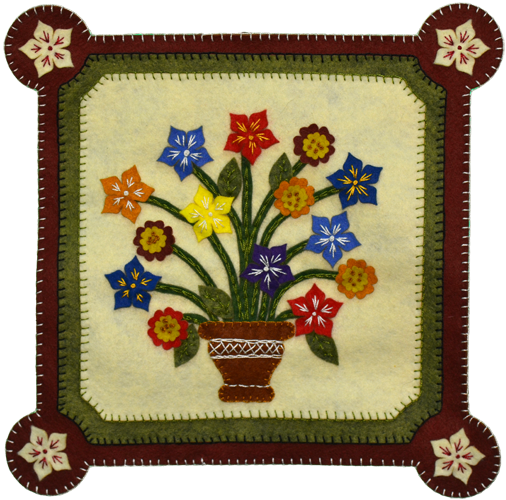 This kit makes a 111⁄2″ square floral sampler.